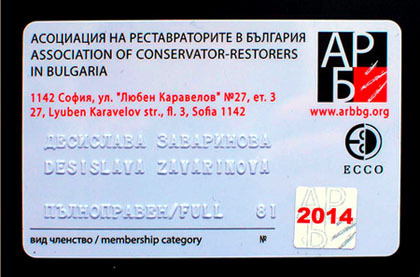 The membership cards of the Association of Conservator-Resotrers in Bulgaria have new design. Designer is our colleague Nadejda Tsvetkova. The Executive Committee of the Association of Conservator-Restorers in Bulgaria convenes the General Assembly on 17thMay 2014. 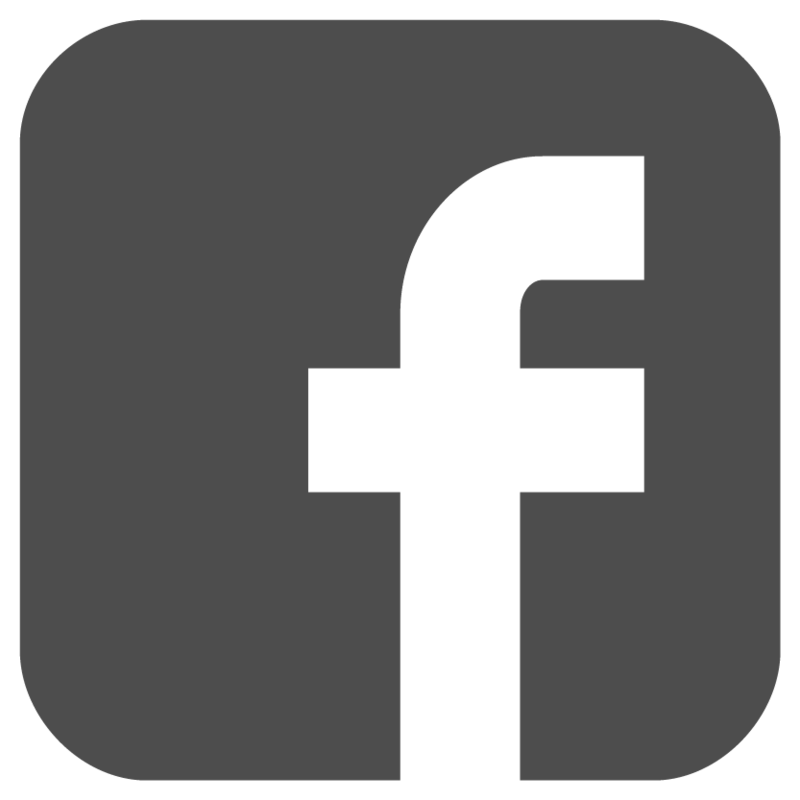 The meeting will take place at 10.00h in the building of the National Academy of Art: 73, Tsarigradsko Shausse Blvd., Sofia. The Executive Committee of the Association of Conservator-Restorers in Bulgaria convened the General Assembly on 14th December 2013. The meeting will take place at 14.00h in the building of the National Academy of Art: 73, Tsarigradsko Shausse Blvd., Sofia. 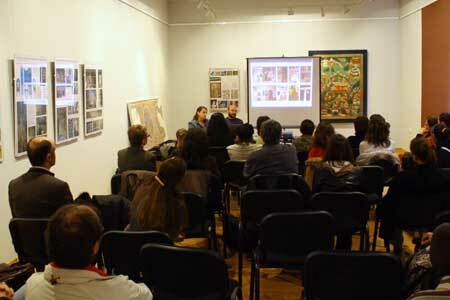 The annual meeting of the Bulgarian conservator-restorers, “Forum Restoration 2013”,will be opened on 31 October 2013. 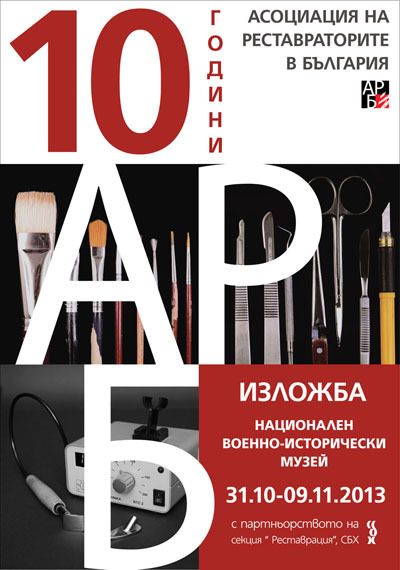 The event is a poster session and will be hosted by the National Military Museum in Sofia. Forum Restoration is a place for sharing experience, professional achievements and discussion of problems in the conservation of the cultural heritage in Bulgaria. Projects, related with the conservation of paintings, books, drawings, mosaics, wall paintings, textile, photographs and others, carried out in the last ten years will be presented. Forum Conservation 2013 is organized by the Association of Conservator-Restorers in Bulgaria and Section Restoration at the Union of Bulgarian Artists. 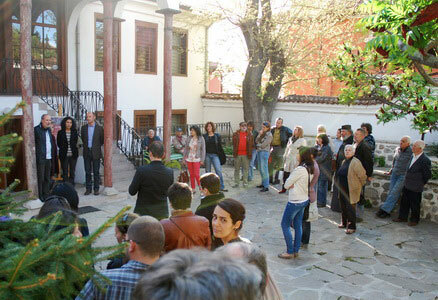 The annual exhibition Forum Restoration 2012 took place from 20th to 30th April in Municipality Art Gallery - Plovdiv. At the opening on 20th April, the Forum was presented to the public by Krasimir Linkov, director of the gallery, Hristina Tsvetkova, curator of the exhibition, and Stefan Belishki, President of ACB. 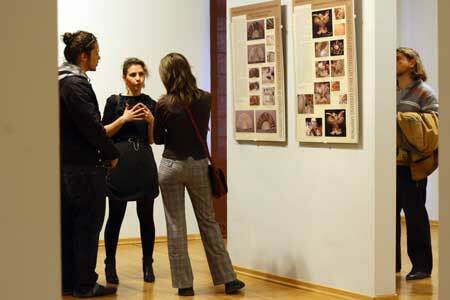 More than 35 conservation projects on various subjects were put on display. Forum Restoration is a joined initiative of ACB and the Conservation Section of UBA. The annual ACB Award for Best Diploma Work on Conservation for 2011 was given to Alexandrina Aenska for her achievements in the research and the practical implementation. 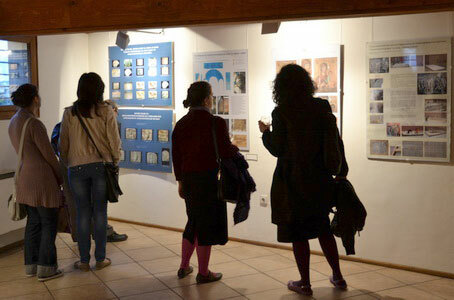 Forum Restoration 2011will be presented in Veliko Tarnovo again - this time with PPT presentation and poster exhibition. On 31 October, Monday, at 15.00h, in Veliko Tarnovo Univercity, Stefko Aenski will present the technological features of a Tibetan Tanka and its conservation. 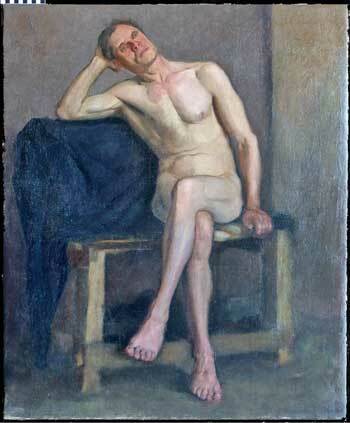 The exhibition opening is on 1 November, at 17.30h in "Raphael Michailov Gallery". 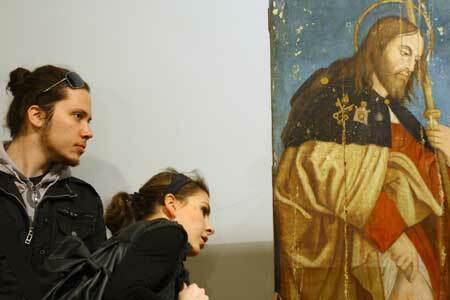 The posters present conservation of paintings, icons, wall paintings, textile and other objects. International participation includes posters from Hungary Greece etc. This is the second issue of Forum Restoration 2011 for this year, after the presentation in Sofia in April and sixth annual meeting of Bulgarian conservator-restorers. 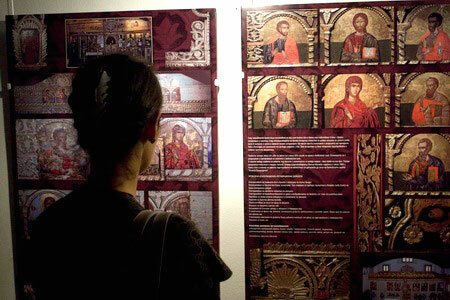 It is organized by the Association of Conservator-restorers in Bulgaria and Conservation Section of the Union of Bulgarian Artists, with the kind support of Veliko Tarnovo Municipality and Orthodox Information Center "Prof. Totyo Koev". 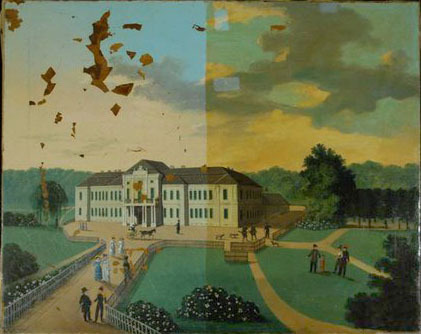 The sixth annual Forum Conservation 2011 was hosted by the National Gallery for Foreign Art in Sofia. It took place from 15th April to 5th May. The main event of the Forum was international poster exhibition, presenting projects from Bulgaria, Hungary, Serbia, and for the first time - from Rumania. 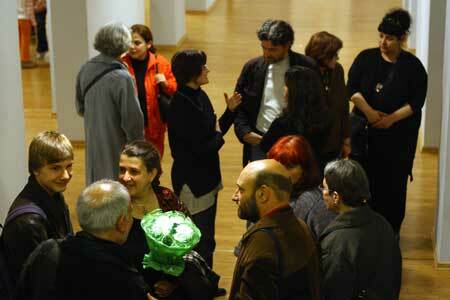 More than 35 projects were presented by 27 institutions and individuals. 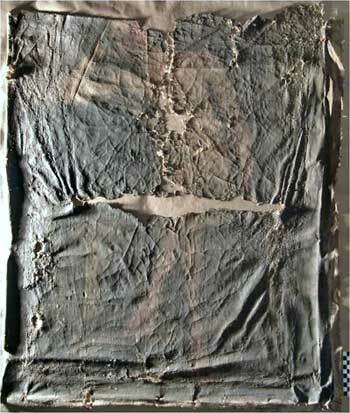 The subjects varied - from panel and canvas paintings, textile, wall paintings, book and paper conservation, to Tibetan art. The Forum was accomplished by one day session of presentations and discussions. Romanian Association of Restorers was special guest to the Forum. Romanian colleagues explained the structure and the activities of their young organization and presented one of their projects. For the first time in the history of the Forum many original object were put on display illustrating attractively to the public the conservation projects presented. The public could also see two short films. One of them was presenting the activities of the Conservation studio of the Centre for Slavo-Byzantine studies at the Sofia University. The other film allowed the visitors to get an insight of the project on the conservation of 14 medieval icons from the town of Nessebar. 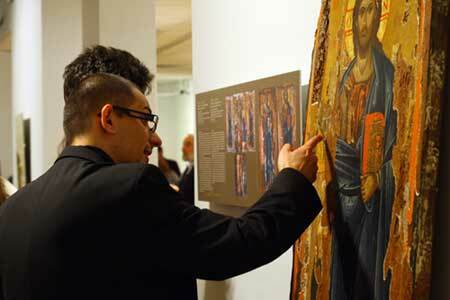 It was a big project, involved the National Gallery, The Association of Conservator-Restorers in Bulgaria and Byzantine Museum in Thessaloniki, and financially supported by A.G.Leventis Foundation. The National Gallery of Foreign Art presented one their most ambitious ongoing projects - the conservation of Giovanni Rosso's large panel painting. ACB founded award for the Best Diploma Work in Conservation. Anna Ilcheva is the first graduate who received it. 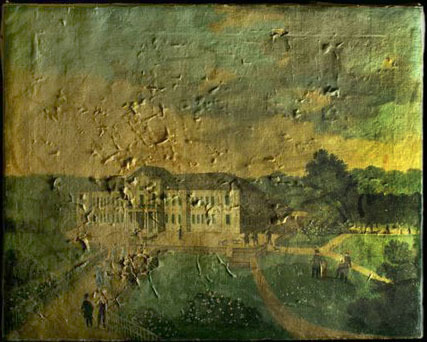 She was awarded for her diploma work “Conservation of a Mid-nineteen Century Canvas Painting”. Р•CCO (European Confederation of Conservator-Restorers' Organizsations) published new document, entitled COMPETENCES FOR ACCESS TO THE CONSERVATION-RESTORATION PROFESSION . The document is available for download here.